I for one am glad to at least see a fly in the ointment. And we can already see the GFS is falsely decoupling the boundary layer much like it did with this past event resulting in only a few hundred joules of CAPE. NAM has a more realistic handle on surface temps, although it's likely underestimating moisture return (again, just like it did with this past system at this range). Everything I have seen or heard in the Birmingham market has been it could be a significant threat. 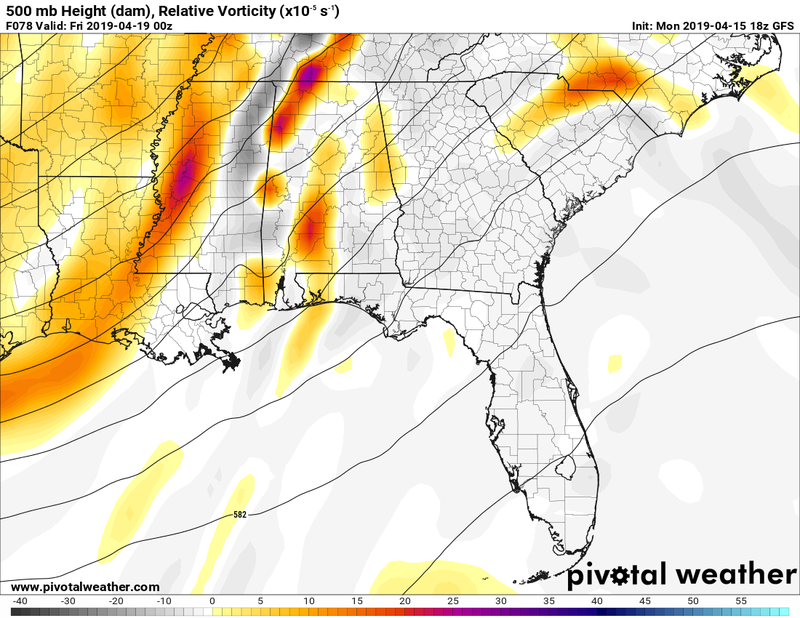 Here's the deal about the instability- there is alot of dry cool air that has been pushed south behind Sunday's system all the way into the Gulf. A return flow from the Gulf is expected later tomorrow into Wednesday. While I am not sure we will see dewpoints near 70°, they will at least be in the low 60's for western sections by Thursday afternoon...some models suggest they will barely make it to the mid 50's...and are probably underplaying this a bit. 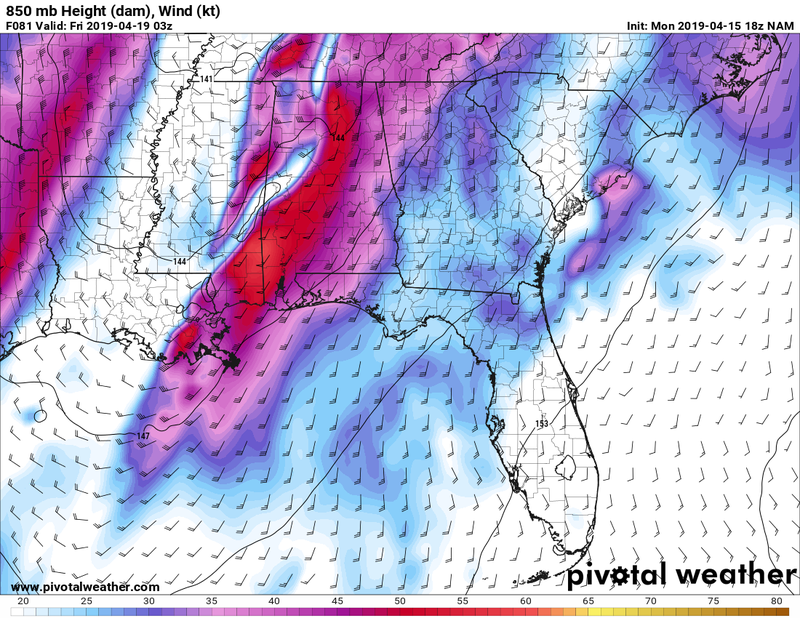 Latest run of the NAM moves a powerful line of thunderstorms through Mississippi and Alabama Thursday afternoon/evening despite limited moisture return and instability (which are probably underdone as noted in previous posts). This could absolutely be a significant event if even more instability is realized. 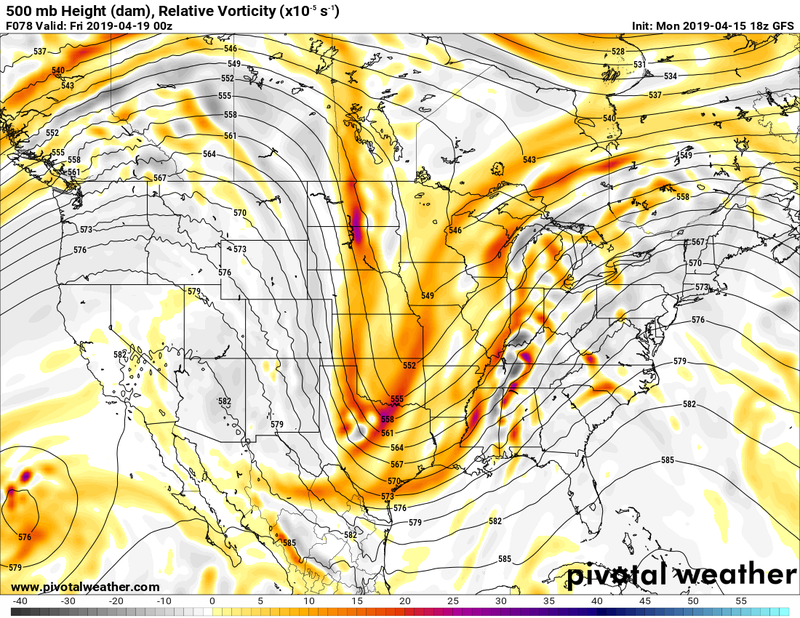 Just curious on the thoughts regarding the 500mb trough orientation. This looks to be coming in with a slightly positive axis. It would be really nice if for this event the local mets, the SPC, and NWS offices could all be on the same page. It would be, but the models aren’t perfect. There is a ton of human interpretation involved. 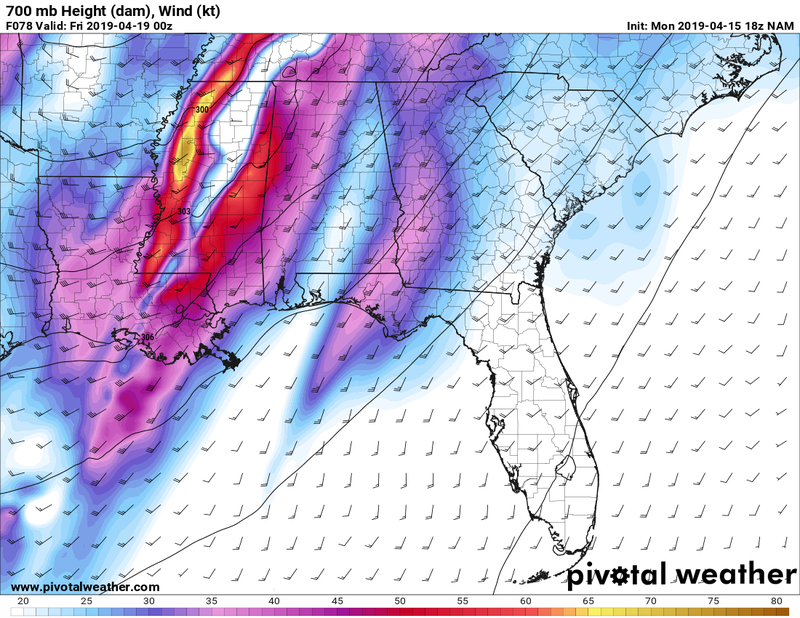 I know we're still 3 days out, but I really am not seeing a significant tornado threat across Dixie Thursday. Pretty substantial damaging wind risk, but it seems way too messy with too many caveats for a significant tornado threat to materialize across MS/AL/LA. 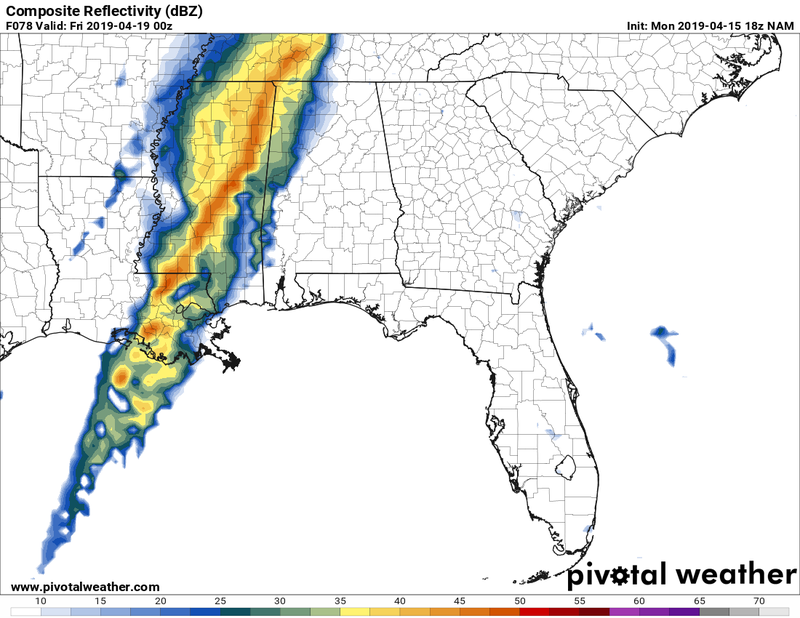 Maybe a decent QLCS tornado threat however. Now that I have said this, watch an outbreak occur. 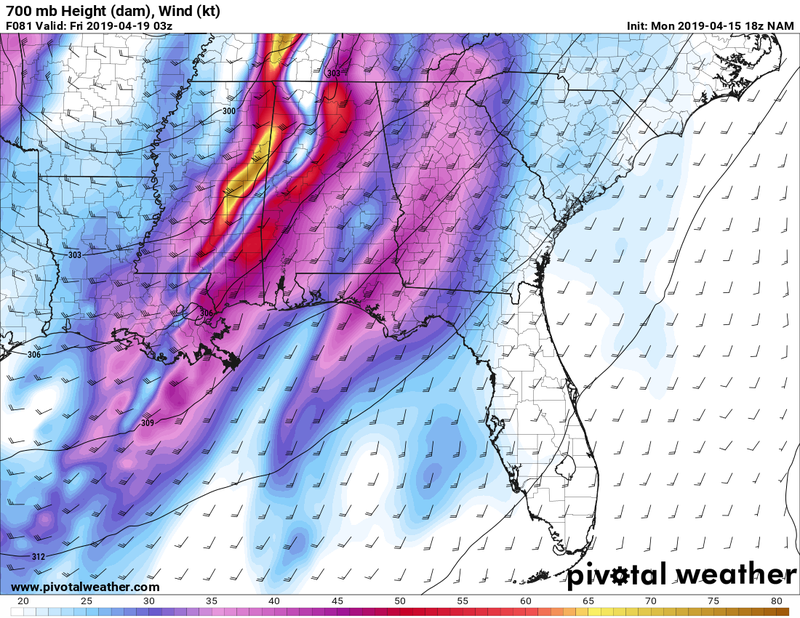 So I'm leaning more towards a QLCS type situation for Dixie Alley, but looking at the 500mb vorticity map off the GFS, I notice some local maxima in Alabama ahead of what would appear to be the main line. Question: would those possibly be supercells ahead of the line? I still think the models are downplaying the amount of instability for Thursday/Thursday night. I do think the instability will be lower than we originally thought. It will be interesting to see where a secondary low forms. Models are showing that as a solution, but they vary on placement and intensity. It will be key on who sees the worst weather. Damaging winds will definitely be the biggest threat with spin-up tornadoes possible along the main line. We should get a narrow band of instability that will allow the storms to become surface based and enhance the damaging wind threat and QLCS tornado threat. Closer it gets more unclear the setup seems to be just based on reading what’s posted here but dangerous for somebody no doubt. Now models are picking up on a secondary low pressure (a strong one at that) moving from Northern MS into TN/KY later Thursday. This will enhance the severe wx threat in MS/AL although I’m unsure that storm mode will cooperate for a higher end tornado threat. This will likely be a nasty damaging wind/secondary tornado threat. SPC just did a day 3 upgrade to enhanced with hatched sig threat for LA/MS.